Situated between Kenny Creek and Horner Creek, both tributaries of Whitemans Creek, this area is rich in agriculture. Nearby Harley Road is known as the “Quaker Trail” for its historical significance as a route for early settlers. 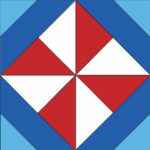 The “Wheels” pattern represents its significance as a transportation route, while the red, white and blue colours evoke the Dutch heritage of the landowners, the Vandenberg family.